Layers of soil underlying the grass. The definition of underlying refers to something lying beneath, or the basic or root cause of something. 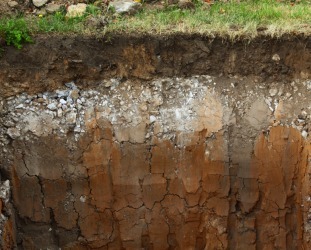 A layer of minerals in the soil is an example of underlying minerals. A lack of educational opportunity is an example of an underlying cause of poverty. "underlying." YourDictionary, n.d. Web. 18 April 2019. <https://www.yourdictionary.com/UNDERLYING>. Lying under or beneath something: underlying strata. Basic; fundamental: the underlying cause of the problem. Present but not readily noticeable: an underlying meaning. Taking precedence; prior: an underlying claim to compensation. The fossils are few, and in some cases probably derived from the underlying formations. Tests gave no indication of an underlying cause. The fact that an unprecedented number of earth's inhabitants today live in poverty is an indictment of governments, not a reflection of some underlying natural limit. However good her underlying motivations, she still lied, tricked and betrayed him.